My bike locked up in Cambridge. A Police and Crime Commissioner for Cambridgeshire needs to ensure that the roads are safe for all users, particularly cyclists. A commissioner ought take a role in ensuring that new developments are cycle friendly and that our existing infrastructure is adapted to reflect the changes which accompany the expansion of our towns and cities. Increased cycling is a key component of adapting to a greater population and avoiding gridlock. 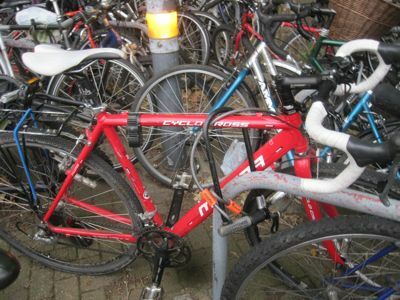 Cambridge has a particular problem with cycle theft which needs to be taken seriously by the police; while educating people about how to protect their bikes is important the tone of the police must not be one of blaming victims of crime. More openness, telling people where bike theft hotspots (and safe places to leave bikes) are will help people make good decisions. Since learning there are very few bikes stolen from Park Street car park I use it more often for example. A commissioner ought take a role in lobbying for more, secure, bike parking. Magistrates need to be aware that cycle theft is a serious problem for those living in the city, a Commissioner will be in a position to communicate messages such as that from the public. Cambridge needs to become the least friendly city for bike thieves, technology (bait bikes) ought be used as a matter of routine and anyone stealing a bike needs to know there’s a good chance of them getting caught. When the police are taking action against things like cycling on the pavement or cycling without lights they need to act proportionately. I would like police action to be focused on where people are causing themselves, or others, a serious risk of injury. I think there is a significant risk of the reputation of the police being damaged by targeting those not really doing any harm. When I see the police stopping students without lights in the well lit, traffic free, streets of Cambridge such as outside St John’s college; but then drive down major roads out of the city past people cycling in dark clothes without lights I think they are targeting the easy pickings and not those causing a danger to themselves and others.